Design-concept driven by need to increase storage, enhance overall functionality of compact apartment, and create open, contemporary environment while still honouring client’s preference for the gracious simplicity of Japanese aesthetics. Client considers entertaining and cooking with friends a lifestyle priority. Wall between disproportionately large entry and cramped, segregated kitchen moved six-feet – kitchen’s footprint almost doubled and formal sense of arrival in foyer preserved. Foyer’s dropped ceiling morphs dramatically into new, full-height hall closet. Viewed from living-room, closet’s narrow edge matches existing structural column to visually frame new eating bar/counter. Bedroom’s under-utilized, walk-in closet, redesigned with adjustable organizers and three-door access. Back corner transformed into hall linen-closet (camouflaged by sliding wood panel) which also reclaims dead-space between original dry-wall. Kitchen’s alternating high-gloss white and dark-stained wood cabinetry extends to dining-room, then reappears as built-in living-room shelves. Resulting continuity further enhances sense of airy volume. 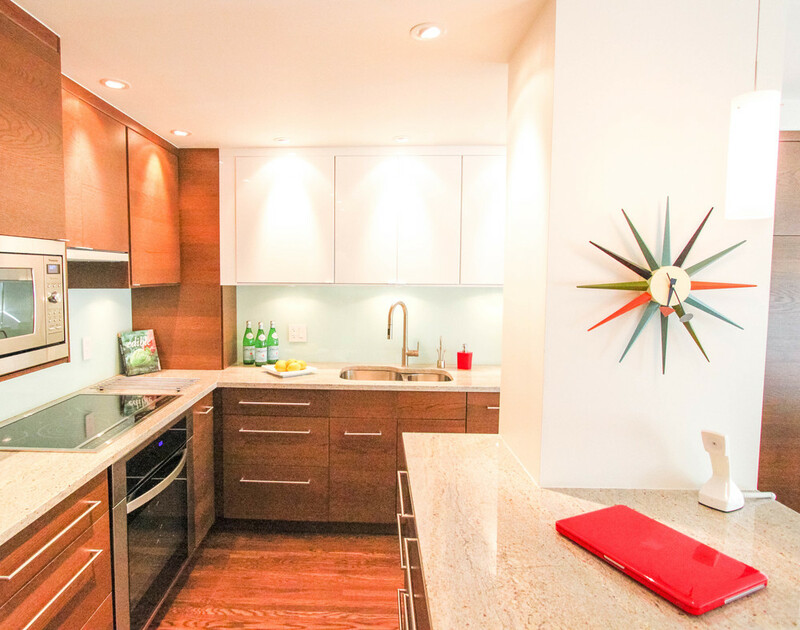 Glass backsplash (elegant, low-maintenance, virtually indestructible) reappears on eating-bar base. 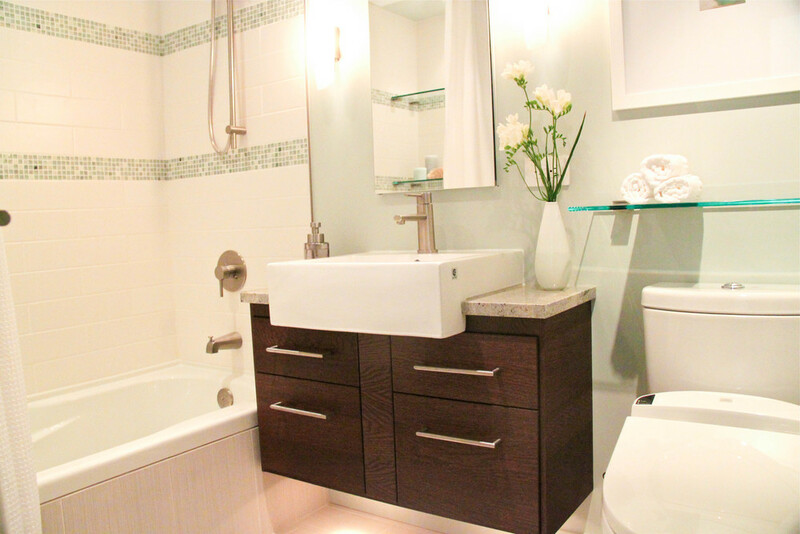 Spa-style ensuite features recessed glass shelving above new soaker tub, single-lever faucets, and suspended sink/vanity. Relocating upgraded/expanded electrical panel without compromising conduit to apartments above and below, required installation of concealed, but still accessible, sub-panel in original location. Suite had no internal heat control. To replace unsightly water radiators with thermostat-controlled heat zones, entire building’s hot water system was shut off and drained – a complex logistical problem requiring coordination between 51 individual apartments. Energy-star appliances (including space-saving single-drawer dishwasher) added. Fifty-year-old hardwood (hidden beneath carpet) refinished and matched in kitchen — environmental alternative saving 65% flooring costs.